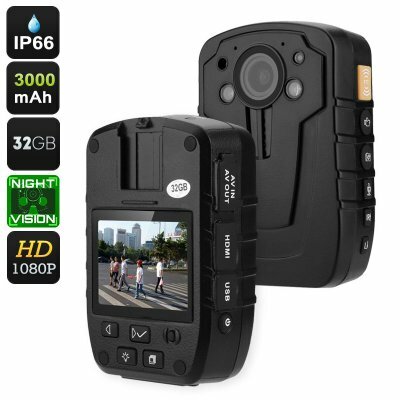 Successfully Added Body Worn Camera - IP66, 1080p, 2-Inch Display, 140-Degree Lens, 3000mAh, Night Vision, 32GB Storage, 16X Digital Zoom to your Shopping Cart. The Q2 Body Camera is a great electronic gadget for bodyguards and private security firms. This police body cam allows you to record all that’s happening around you while you’re on your shift. Thanks to this, not a single moment will stay uncaptured. These recording may come in handy during future disputes and arguments about what happened during your working hours. From now on, you can be assured that you’ll never be bothered again by false insurance claim or accusations over minor incidents. With its 3000mAh battery, this body cam works for up to 8 hours in a row. This means it packs enough juice to get you through the longest of shifts without needing to worry about its battery life. Your body camera features a built-in microphone thanks to which it does not only record visuals but also high-quality audio. It furthermore has an IP66 design which makes it resistant against water, dust, and drops. You’ll be able to use this electronic gadget anywhere you go and in any weather condition. Nothing will stop this body worn camera from operating. Additionally, it packs IR LEDs that provide you with up to 7M night vision capabilities. Whether it’s day or night, nothing will be able to escape your body cam. This police body camera comes with a 12 months warranty, brought to you by the leader in electronic devices as well as wholesale electronic gadgets..